How to Repair Old Windows | 41 Lumber - Serving Iron Mountain and the U.P. One of the advantages of having old windows in your house is that for most problems, a simple repair job is all that you need. They are designed in such a way that repairs can be done piecemeal, unlike some modern replacement windows that would require either to be sent back to the factory for repair or replaced altogether. Just because your old window may be cracked or the glazing (putty) has fallen out in places, doesn’t mean all is lost. You can do such repairs in just a few hours and for a few dollars, rather than replacing the entire window. First off, if you’ll be removing broken glass, be sure to wear heavy duty work clothes and goggles to protect your hands and eyes. Attempt to wiggle free any broken glass, though you may have to remove the rest of the glazing to do so. For that, use a putty knife along the area where the glazing meets the wood, as it tends to break free easier at that point compared to where it meets the glass. Be careful not to gouge the wood frame. If the putty is resistant, you may need to tap it gently with a chisel. When you encounter a metal push point (they are used about every six or 8 inches to hold the glass in place) you need to pry them out with a pair of needle nose pliers. Once the putty and push points are removed, any remaining glass should be able to come out. If you’re just re-glazing and the glass won’t be removed, leave the push points in. Next, sand smooth any exposed wood. Thoroughly dust the area and apply a coat of wood primer (oil or water-based is fine) to the bare wood. This will provide good adhesion for the glazing compound. At this point, prior to placing the pane of glass in (if needed), first apply a 1/8 inch bead of putty along the surface where the glass will be seated. This will provide a good seal and keep out moisture. Place the piece of glass onto the prepared area and press carefully down onto the bead of glazing compound. Once evenly seated, place push points about 2 inches from each corner (both sides) and every 6 to 8 inches in between. Once the points are in place, you can begin to apply the outer layer of glazing. You’ll notice it’s pretty stiff right out of the container, so for best results, you should knead it for a few minutes to allow the warmth of your hand to soften it. Roll it out to form a string about ¼ inch thick and place it into the groove along the edge of the glass, over the push points. Press it into the area with your putty knife. Once you are finished, remove the excess putty and smooth out what remains by pressing from one corner of the glass with the flat edge of the putty knife. Draw in a long, continuous motion to the other corner. The idea is to “flatten” the putty into the corner, leaving a smooth, even edge. It may take a little practice, so if it doesn’t work the first time, just roll the putty back up and try again. The completed putty should be allowed to “cure” for a few days so that it may form a skin. At that point it should be ready to paint. 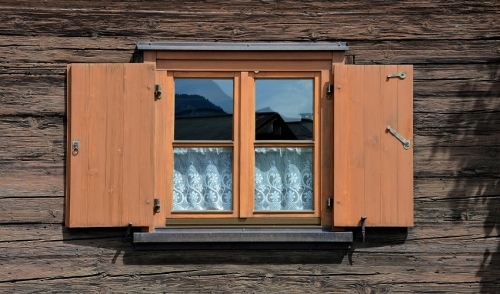 By repairing your old windows, you’ll be saving money while, in many cases, preserving the historic value of your home. For all of your window repair needs such as paint, tools, glazing compound and more, stop in and we’ll be happy to answer your questions and help you get your project underway. In the event that your windows are too damaged and need to be replaced altogether, we’ll be glad provide you with a suitable replacement.